Here is a link to chapter 3 of my book. Since this chapter introduces my first citations from the Church Fathers, regarding the exposition of Romans 8, some explanation may be in order. First, on their use here, which is quite different from that in the next section of the book. There, the aim of the argument is to show that there is very strong Patristic testimony in favour of the concept that the natural creation is not fallen. Here, they are used to bring some light on the history of the interpretation of five verses in Romans 8 that are usually simply mapped uncritically to the present concept of a natural creation gone bad. In the chapter, the passages are not quoted directly, in the first place because it would have made the chapter very unwieldy, and secondly because one needs to digest the Fathers’ arguments in their context, and pull-quotes inevitably detach them from the developing thought (and the overall authorial intention). For that reason I opted to distill their use of the verses in question, because otherwise I would have needed to quote several pages at a time. Second, regarding my own acquaintance with the Fathers. 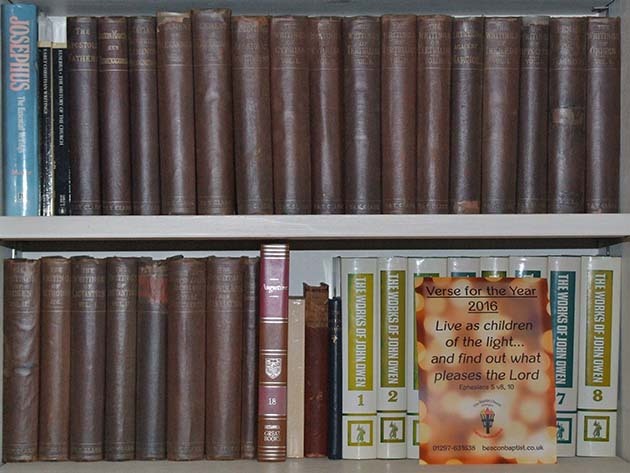 I first started reading them back in the 1980s when I had unusual access to Chelmsford Cathedral’s Knightbridge Library through the librarian, a scholarly gentleman who was my patient. The library was wonderfully out of range of telephone contact – a great benefit for a doctor – and was unused by anyone else except a theology scholar who travelled down from Hull University occasionally. The original Reformation stuff was pretty priceless (Geneva editions of Calvin and Luther, for example – unfortunately in Latin), but I occasionally took out the Victorian Patristic editions, which were less valuable, and I well remember reading Origen on the London Underground on the way to a medical conference. I bought my own set of the Ante-Nicene Fathers in 1993, and they have proved a valuable and oft-visited resource in my studies, and it was this which I consulted for this chapter as well as the main Patristic section of the book later on. Fortunately the Fathers are now easily available online, so I have included links below for you, though you’ll have to get the exact references from the footnotes and, most importantly, read and digest at least the entire context before and after – though of course, ideally the entire works. Only this last labour will be sufficient to drive home the fact that, in many cases, the Fathers were simply not interested in the questions that we moderns are asking, and so we are always in danger of mis-applying the answers we find. One graphic example of this is relevant to the whole book, and that is the idea very current amongst theistic evolutionists, deriving largely from John Hick, that the Fathers developed two competing theodicies of nature, the Irenaean and the Augustinian. Such a construction is, in my view, imposed on the writings, not derived from them. Ch VI has described only mankind as corrupted by an enemy, and Ch VIII turns to the question of the non-human creation, where Romans 8 is first mentioned. Creation’s groaning is described as being “on behalf of man”. Ch IX goes on to expound the natural creation’s transition not from evil to good, but from original to better. The citation is in ch37. The Augustine citations appear not to be available in English translation, at least online. “…you’ll have to get the exact references from the footnotes and, most importantly, read and digest at least the entire context before and after – though of course, ideally the entire works. Me: “Ah, but *some* IS found, as even you admit. Anyway, that the Bible should have so few verses on the topic should not be surprising. Because the Bible is not about and for animals, the Bible is about and for man. But why in heaven’s name would the Bible writers even consider the possibility of eons and eons of animal death prior to the appearance of man? What would lead them to such a thought? Nothing that I can think of. It seems to be a thought, even an obsession, only of modern day TEs/ECs. I’m not sure I’ll spend much time looking for a needle in a haystack. Especially considering the sought for needle may not even be a needle. Apart from what I laid out in the general introduction, the only use of the Patristic sources I’ve made so far is to enquire into their interpretation of Romans 8, today. “Apart from what I laid out in the general introduction, the only use of the Patristic sources I’ve made so far is to enquire into their interpretation of Romans 8, today. I spent the last fortnight primarily in challenging *your contention* that Scriptural evidence and Church Father support was *distinctly lacking*/*unknown* for the idea that the natural world is fallen or corrupted by man’s sin. And related to this, I spent time challenging *your contention* and *Edward’s contention* that man’s original created nature (i.e. pre-Fall nature) was characterized by mortality. I also spent some time challenging you and Edward to provide *any* Scriptural evidence or Church Father quotes supporting the notion of man’s original mortality and of animals’ mortality for eons before the advent of man. I won’t have to wait another week to continue browsing your unfolding epic. So, Edward can take a break from here for the next week or so, and focus on his day job. Whatever his day job is, if it’s unrelated to this stuff, he should try to keep it. I provided very clear evidence from Genesis of man’s original mortality, reasoning from Genesis 3:22 and other verses. Man’s original *natural* mortality is not only Biblical but also the Catholic teaching, and always has been. It was always understood that the possibility of immortality was of grace, not of nature. Your own Catholic authority (in the parts of his article that you didn’t read) confirmed that. I never made any claim about “eons before the advent of man.” My argument for animal mortality is just as cogent on the assumptions of six-day creationism as on the assumption of eons of geological time, because it’s based on textual statements, not on speculations about the actual timeline of the origin of the world. By the way, you cannot fairly complain that I did not reply to your last questions in your final post on the other thread, because I promised to let you have the last word. It was illogical of you to ask me questions when I could not reply. It would have been better if you had simply made a final statement of your position. But since you chose to ask questions, you will have to go answerless. [“Secondly, *even if we run with your implication*, who’s to say the pre-Fall Adam wouldn’t eat from the tree of life *at some point*? How much time would he have to eat from it? 50 years? 500 years? 5,000 years? Seems in all that no doubt substantial amount of time he’d get around to eating some (Even though the text does *not* indicate God ever commanded Adam to eat of it.). And how much would he have to eat of it, and how often? The implication could be just a nibble in an immortal lifetime. EVERYTHING that Adam had, and consisted of, was by grace. (Unless you posit the dirt “self-organized” and voila!). *Where* in the Catechism of the Catholic Church or in similar authoritative Catholic writing does it say Adam would have died if he didn’t eat from the tree of life? But what you haven’t yet admitted is that Scripture has *no* verses pointing to animal death prior to the appearance of man. Taken for granted based on what? I would think NOTHING can be taken for granted. If the text does not say explicitly that the pre-Fall animals were mortal and does not say explicitly that the pre-Fall animals were IMmortal, than we can’t take their mortality OR their immortality for granted. I’ll only say that Adam & Eve’s Eden should probably not be viewed with a post-Fall *worldy mentality*. For Adam & Eve’s Eden was *essentially like* heaven, if not exactly like the heaven now. As I said, *similar* to my line of thought of Eden being somewhat *other*-worldly. I’m not 100% sure, but I’m almost certain you’ve reneged on your word to me in the past, and responded further *after* saying you wouldn’t. But you can answer now, here. [And my question didn’t ask about man being “fallen”. My question was about man having a “fallen NATURE”. You appear to agree that Catholic tradition as well as virtually all Protestant tradition includes the teaching of man having a “fallen NATURE”. Now, it follows from this that the NATURE of man *before* the Fall was better or more elevated than man’s nature after the Fall. What also follows from this is that the un-fallen/better/elevated NATURE of man *pre-fall* was characterized by *more than just* sinlessness/obedience. What follows from this is that the un-fallen/better/elevated nature of man pre-fall was characterized *also by* immortality. Why? Because, as I’ve pointed out about THREE TIMES PREVIOUSLY (and got no response), where would *sinless/ever-obedient/never disobedient* Adam’s body and soul go if he were to die? Not to heaven, because he’s already essentially there. Not to hell, because he hasn’t done anything wrong. Solution: The sinless/ever-obedient/never disobedient Adam can NOT die. My undergrad alma mater is the new NCAA basketball national champion! Jon, I haven’t been through all the chapters that you have posted, so I may have missed it, but a reference to Bimson’s article on the cosmic fall in CiS might be appropriate. I was unaware of Bimson’s article until you cited it (interested persons will find it here). That reflects in part the fact that my stuff was personal research added on to the original project of reviewing the ancient commentators, of whom Bimson really only cites Theophilus and Augustine. There are a lot more modern scholars I haven’t referenced than those I have, which is maybe inevitable – there are a lot of them. If I wanted to lay claim any new thinking, it would be on the theme of nature as God’s usual means of Israel’s (and the nations’) governance in ch 1. My main point of disagreement is his excursion into kenotic free-process theology which, you will well know, I find to be as unsupported in Scripture as a fallen creation. Both, it seems to me, start from a jaundiced view of the way Creation operates rather than with what Scripture decribes together, perhaps, with an overblown idea of mankind’s centrality to it all. This is the main issue I deal with in Part 2, on the development of the doctrine. That should begin to appear here after the weekend. The Catholic catechism does not spell out everything that is stated or implied in the Bible. Otherwise, it would be as long as the Bible. Further, it’s not the job of the catechism to provide a complete exegesis of all the stories in the Bible. It has a different function. The catechism assumes that Biblical exegesis will be carried on in other venues, by the normal methods, including the employment of plain common sense. It’s quite evident from plain common sense that Adam’s immortality depended on eating the fruit; it’s a basic inference from the story. So if the text doesn’t say that the sky in ancient Israel was blue, we don’t have the right to take for granted it was blue? Maybe it was green? And if the text doesn’t say that the Israelites were about 5 and half feet tall, we can’t be sure they weren’t 10 feet tall? We aren’t allowed to assume that words mean what they normally mean? That “domestic animals” and “wild animals” mean what they normally mean? As for how much fruit Adam needed to eat, the Bible doesn’t say. And it doesn’t matter. We know that God ejected Adam from the Garden before he ate enough of it to become immortal. So if even one little nibble would have made him immortal, then he didn’t have even one little nibble. But who cares? You might as well ask whether the fruit was a pear or an apple or a banana. It doesn’t matter. The Bible doesn’t tell us what we don’t need to know. What we need to know is that man is cut off from the tree of life, and that his lot (at least until the eschaton) is to die. The garden of Eden is not heaven. Heaven is defined in Genesis 1 as the expanse of the sky. And Genesis does not mention hell. So your question has nothing to do with the story in the text we’re talking about. That’s why it can’t be answered in the way you want it answered. Your terms of reference are wrong. Further, the question where an obedient Adam would go when he died is pointless. If he had been obedient, he wouldn’t have died, because he would have remained in the Garden, with access to the fruit. I’ve now discharged my obligation to answer your previous questions. *Where* in the Catechism of the Catholic Church *OR IN SIMILAR AUTHORITATIVE CATHOLIC WRITING* does it say Adam would have died if he didn’t eat from the tree of life? No, you can take for granted that things were then as they are now, *unless* the text gives indication that they might not have been. And the text *does* give indication that they might not have been (e.g. Gen 1:29-30; Gen 2:17; Gen 3:22; Rom 5:12-14; Rom 8:22-23). “And God said, “Let there be lights in the firmament of the heavens to separate the day from the night; and let them be for signs and for seasons and for days and years” ? Or at least my Catholic Church allows it. Makes sense. Regarding trees, I think we can agree (or take for granted?) that Adam would have lived forever had he obeyed God and not eaten of the tree of the knowledge of god and evil. So, if the Genesis text does not mention hell, we can take for granted there was no hell back then? But if the Genesis text does not mention the sky was blue, we *can* take for granted that *was* blue back then? Now, THAT would be a real doozy. Your words give the impression that we may read the Genesis text in some kind of bizarre vacuum. I thought we were to read Scripture in, among other things, the light of Christian tradition. And doesn’t virtually all Christian tradition say every human being will ultimately end up in either heaven or hell? Yes, Adam would have remained immortal; His created nature included immortality. But that nature “fell”, and we’ve had a “fallen NATURE” ever since. and really the *reason* for all of his (and others’) writing at this website. His *REASON* is to reconcile his version of religion to something he believes to be true, namely, EVOLUTION. Oh, and maybe some science, too. the entire edifice of evolution stands on one thing, and one thing only. It’s not 5,000 years of Judeo-Christian religious and theological tradition. It’s not biology, or anything that’s ever been observed in nature or in a lab. It’s not paleontology, or anything that’s ever been observed in the rocks and fields. The entire edifice of evolution stands on one thing: TIME. Cath Olic just overstepped the mark and got himself banned, which I think will be a relief for most readers. I don’t think it’s the first time I’ve had to ban him, though I was more patient with this incarnation than his previous alter egos. It seems that you favor the pre-1500 minority report that ktisis “creation” in Rom 8 refers to the natural world (personified, tied to mortality and corruption but not fallen) rather than the majority report as solely human creation. Is this correct? You’re reading carefully I see! Yes, I’m aware that having made a strong case for “ktisis” meaning “the human creation” I then revert to the idea of a personified view of nature instead. My reasoning is that I can’t really make final sense of the idea of un-redeemed mankind longing for what the saints have (rather than longing for the saints to disappear and leave them to it), whereas I can make sense of an innocent, but insulted, natural order being represented metaphorically in that way. In the end, though, in either case I believe the case for “phthora” meaning “materially corruptible by nature” rather than “subject to death through sin” is strong.